While walking the streets of Minneapolis as the city gears for a full-on day of PLA, store windows shouted out truisms (and ploys to buy their spring lines). This truism was worthy of a snap. Simple can be quite sublime. As I move forward in this conference with a myriad of workshops, meetings, catch-ups and info to seek out, “Keep It Simple” sounds good right now. 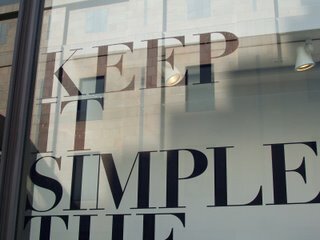 What are you doing to keep it simple (and effective)?